Over the edge? Think again…here’s the story behind the site. Some people may seem to think this movement against Pat Torre is “Over the Edge”. I, however, do not. It is my belief that by putting the facts out in front of the people in a clear and concise manner, Pat Torre will have a shrinking window of opportunity to defraud others again. This could be conceivable, if we keep sharing information and presenting it to the public, as well as making sure the public has a good resource available to them. Not only to prevent further damage, maybe get a small gift of satisfaction, knowing this is publicly shared……but if at all possible, maybe even recover something that belongs to them. A new motorcycle shop opened in 2013, Global Motor Werks, located right next to the Orlando Harley-Davidson dealership. Plenty of traffic, seemed like a great place until you understand the truths. My wife at the time, decided she doesn’t ride her 2007 Heritage Softail enough to justify keeping it, so she put the bike on consignment there. Pat Torre, manager of the store, took the bike in on consignment and said he would keep her posted on the status of the sale of the bike. A couple months went by and the bike remained at their lot for sale. I drove by it several times going to the Orlando HD dealership for service on my bike, so I knew it was still there. Then the problem suddenly arises, the bike is gone (found out through a friend the bike was not on display there anymore and a few calls to talk to Pat at Global Motor Werks for a status turns up nothing). After many calls, a trip to the store was made to find out what’s going on. The front door was closed, no bikes out front. A tug on the front door opens it, only to find the inside empty minus two bikes….and you guessed it, neither bike was ours. After being asked what is happening, the guy inside gave us a number to a lawyer firm, stating that Global Motor Werks was closed for business and any questions needed to be answered by their attorney, Chris Hayes of Kilgore Pearlmean (www.kpsos.com). This was another dead end street. Apparently the attorney stated that Pat’s fraud tactics (selling consignment bikes and not paying the owner) put the company in a bad position and that several complaints about missing bikes have surfaced. He went on to say that they’re sifting through all the information to find out what the next steps were, because there was no paperwork of any kind on our bike (or the others, as well) in any of the files at the bike shop. I knew that filing a police report was the next REAL step. The detectives involved said that they have been doing paperwork on several bikes reported stolen under the GMW business name and that Pat Torre was the person of interest because he was the person who took possession of the bikes on behalf of GMW on consignment and they we well aware of his fraud schemes. So it seems that a $12,500 motorcycle just up and vanished into thin air! I have heard nothing back from the Orange County Sheriff’s Office (OCSO) detectives either. (doesn’t seem like much is being done about it) So now what? After several months and a bunch of calls to the OCSO with no status change and several emails asking Mr. Chris Hayes what the heck was going on (and being ignored about 90% of the time), I finally received an email from Chris stating that GMW does not have the capital to satisfy any claims of loss and that we’re on our own. So I went online and checked the electronic title status to see who the newly registered owner is, the title still shows “pending dealer transaction”. So I decided to contact the Florida DMV to see if there’s any way to stop the dealer transfer. The county office could not give me the information that I needed because it was above their jurisdiction, so they asked me to call the state office. A call to the state office revealed that as a consumer, we can file a complaint against the dealer and that dealers have to carry a bond, insurance money for correcting bad deals like the one I’m stuck in. I was told we have to FAX a complaint letter, stating what had happened and to ask for the a copy of the bond information, along with all documentation supporting our claim. 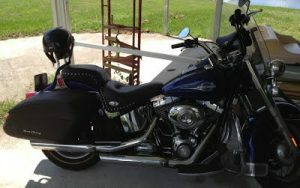 After filing the DMV report about the bike deal gone bad (letter to DMV stated it was reported as stolen), the lady from the Florida DMV shared that the SAME day that the the consignment paperwork was done, the electronic title transfer request was made. Can you believe that GMW put the transfer of new owner in motion electronically through the Florida DMV within 24 hours of dropping off the bike?!?! Now, how can this be, if it was on consignment??? Moving along the path towards corrective action, a complaint was immediately filed with the bond company…..so now we sit and wait for an answer. Who knows how long this process takes or if a dime will ever be paid on the bike…. My thoughts about being scammed, seriously ask the question: Is the bike even on US soil? The GMW advertising info showed they also export bikes. :o/ This situation is exactly why electronic titles are a BIG mistake. If you have a vehicle with an electronic title, convert it ASAP! It’s worth the fee to convert it, believe me. Having a paper title prevents anybody from changing the ownership of your vehicle, without the paper title in-hand and your signatures, especially situations like this one. Screamin’ Eagle slip-on’s and Pyle silver ipod speakers on the handlebars. WOLO Bad-boy air horn kit. 6/28/2014 – The bike was seen twice in Saint Cloud and was last seen on 6/18/2014, behind the Wal-Mart / Home Depot area, entering the Blackberry Creek subdivision. Please keep your eyes out for it. If you see it, please report this to the Saint Cloud Police Department ASAP. 11/3/2014 – The bond company is refusing to pay on the loss of the bike, stating there’s no money left to pay out on bond claims. Looks like the well has run dry. 11/12/2014 – New “owner”, or should I say possessor of the motorcycle, came out of the woodwork this week, demanding release of the title to the bike because he cannot transfer the title. Quite interesting how the guy that has the motorcycle, lives a whopping 5 minutes away and calling us to release HIS motorcycle title? EXCUSE ME?!?! 12/23/2014 – Happy holidays to my web visitors! (minus the fraudster and his circle) New update: The FL title agency has put a hold on the title and the new “possessor” of the motorcycle is quite upset because he cannot get a clear title. Police still will not retrieve the motorcycle and this guy rides it like he owns it. My best guess is when he’s tired of riding it and needs money, it will be an insurance claim somewhere because he will never get a clear title so he can sell it. I may just start posting his info here and see if I can rattle the cage enough to piss him off and make him do the RIGHT THING! All he has to do is turn it over and we will gladly supply him with any documentation he needs to get the lender to let him out of a fraudulent sale/loan. 4/7/2015 – Local guy still has yet to turn over the bike and the police won’t do anything about this anymore, nor have we heard anything from the Orange County detectives handling the GMW case. Hmmm, how strange. How does a case like this, with SO MUCH INFORMATION, go dormant? Whatever, don’t expect for me to vote for any of you when it comes time again…. VALUABLE INFO TO KNOW: Anybody that puts a title transfer stop in place with the State of Florida, it is usually only good for 30 days. It takes a court order to put a permanent transfer prevention status on a title.